1957 Sun Dance Album of Carl Perkins, 1225. Sun EP 115, featuring "Sure to Fall", 1961. "Sure to Fall (in Love with You)" is a 1956 song written by Carl Perkins, Bill Cantrell, and Quinton Claunch. It was recorded by Carl Perkins in December 1955 and was planned for release as the follow-up to "Blue Suede Shoes". Carl and Jay Perkins were on vocals. The song was not issued, however, as a single on the Sun Records label at that time. A test pressing was made. Sam Phillips circulated dubs or acetates to local radio stations of the proposed single. The Sun catalogue number was 235 backed with Perkins' song "Tennessee" on the b-side. The Sun master numbers assigned to the two sides were U 177 and U 178. Liner notes for the Rhino Records release of Carl Perkins' Original Sun Greatest Hits, however, listed the single as being issued at the time as 235DJ, available to disc jockeys only. 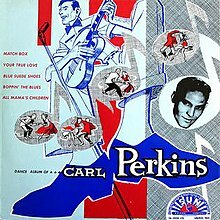 The songs were released, however, on the 1957 Sun LP Dance Album of Carl Perkins, 1225, re-released as Teen Beat; The Best of Carl Perkins in 1961. This album was also released in the UK on London as HA-S 2202 and is where The Beatles heard the songs. The song also appeared on Sun EP 115 released in 1961. Sun Records under Shelby Singleton did release a "Sure To Fall"/"Tennessee" single, Sun Golden Treasure Series, Sun 5, but it was in the late 1970s when the Carl Perkins 45s were re-released. The song also appeared on Sun EP 115 released in 1961. Carl Perkins recorded the song in 1970 in collaboration with the band NRBQ on the eponymous album released on Columbia Records, CS 9981.